Invisalign® Teen has radically changed orthodontic treatment by offering a virtually invisible alternative to metal braces. The clear removable aligners are custom-made for your teen’s teeth and are worn over the teeth and changed out every couple of weeks. As the teeth gradually move into their correct positions, a new aligner is created by our staff. For most of our patients, the aligners are every bit as effective as traditional braces. Drs. Birth and Fletcher are both Top 1% providers of Invisalign® . They have the knowledge and experience to help you and your teen decide if Invisalign® Teen is right for their treatment plan. Invisalign aligners are removable! (Braces are not.) If your son or daughter is an athlete, they can play sports without any concerns about being hit in the mouth by a ball that could cause serious damage to braces. Nobody wants to deal with broken wires and an unexpected trip to the orthodontist to repair the damage. If your teen plays in band, removing the aligners makes it possible to play a brass instrument comfortably without the challenges that wearing traditional braces create. When wearing braces, there are a lot of foods your teen shouldn’t eat. When wearing metal braces, it is best to avoid popcorn, hard candy, even healthy foods like carrots and apples. Not so with removable Invisalign® Teen aligners! They make brushing and flossing much easier as well. Teens feel less self-conscious. As a parent, you know that your teen is going through a challenging time in life when it comes to self-image. A lot of parents underestimate that their teen can feel self-conscious about having crooked teeth. Unfortunately, using braces as a solution may make them feel even more self-conscious. 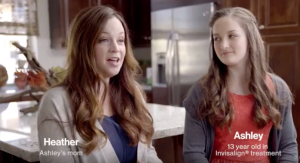 With Invisalign® Teen, the aligners are almost invisible. This could go a long way towards reducing any anxiety for them, giving them the confidence to be themselves. Many teens think Invisalign® is cool and they enjoy wearing them. In fact, show that on average teens will wear their aligners for just under 21 hours per day – exactly as recommended! Invisalign Teen saves time. With no adjustments or broken hardware to fix, your teen won’t have to spend as much time with the orthodontist as they would if they had traditional braces. Follow-up appointments are spaced four to six weeks apart. Some patients can even see a decrease in treatment time too. Ask Dr. Birth or Dr. Fletcher how your treatment plan could be shortened. Changing aligners faster and other technological tools available to BSF Ortho may increase the speed of treatment for some of our patients. Invisalign Teen works for most teens. Most teens qualify to use Invisalign® aligners. However, some cases are challenging. At BSF Ortho, we are among the Top 1% providers of Invisalign® in the world, because we treat more cases than many other practices. Additionally, our orthodontists are board certified. So, we’ll be able to give you and your teen the best assessment to see if they qualify. Invisalign® Teen is a true custom-treatment for your teen and yet, it costs about the same as traditional braces. Many dental insurance plans cover Invisalign®treatment. At BSF Ortho, we can help families that might also need an affordable payment plan. Invisalign Teen is highly effective. As long as your teen wears their aligners as recommended, Invisalign® Teen is every bit as effective as traditional braces for the treatment of mild to severe cases – including underbite, overbite, overcrowding, and gaps between teeth. There’s a great chance your teen will be an excellent candidate for Invisalign®. Effective treatment always requires some personal responsibility on the part of our patients. With braces there’s more to do – other orthodontists will prescribe head gear and elastic bands to go along with all the visits in the chair to tighten braces. With Invisalign® Teen, teens just have to wear their aligners and take them out to play sports, eat some foods and play an instrument. Invisalign® Teen aligners even offer a compliance “blue dot” that will help your teen and our office keep them accountable. If they lose an aligner, we can offer up to six free replacements! Invisalign® Teen is the clear (virtually invisible) alternative to braces. As a Top 1% Provider, Orthodontics by Birth, Stewart and Fletcher has the experience and knowledge to help your teen enjoy the very best orthodontic treatment available today! We offer a FREE consultation and can answer any and all questions you and your teen have so they can get the smile they’ve always wanted!